We recommend that you should check the condition of your tyres at least once a fortnight. If you need us to check them call in to any of our 30 branches provincewide. Some drivers don’t understand that you are not insured when driving on illegal tyres? If you have an accident and it turns out that you have been driving around on tyres with a tread depth lower than 1.6mm (legal limit in the UK) you could find yourself footing the bill for repairs never mind the possible fines. Worn tyres significantly affect the performance of your car, - lower tread depths reduce the effectiveness of braking, steering, and acceleration, all of which are vital in staying safe. What are a few minutes put aside now to check your tyres, when you compare it to your own safety and that of your family? 1. 1 Check tyre tread depth. 2. 2 Check all tyre pressures. 4. 4 Check signs of irregular wear. A tyre does not have to look flat to be under inflated. Check the pressure at least once a fortnight, if you don’t know what the correct pressure is for your vehicle, have a look in the Vehicle Manual or give us a call. · Al Always remember that tyre pressure should only be tested when your tyres are cold - a good guideline is to leave them for an hour after driving so that they can cool down. · If If you drive around on under or over inflated tyres, your vehicle's handling will be seriously affected – in most cases the vehicle will become unstable. · ThThe wrong tyre pressure also increases tyre wear, significantly shortening its lifespan and increasing the chances of the tyre failing whilst driving. If your tyre is not evenly worn across the surface, then this could be a sign of over/under inflation. However, if it is only worn on one edge it could be an indication that your wheel alignment is out. We offer a free wheel alignment check at our branches. 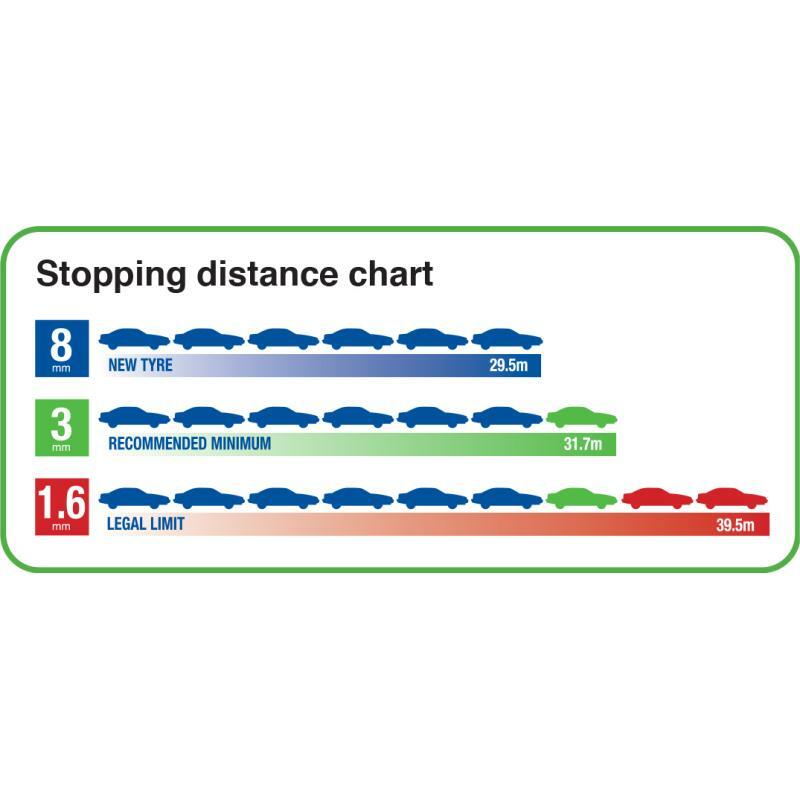 The current British legal limit for car tread depth is 1.6mm (across 75% of the tyre). 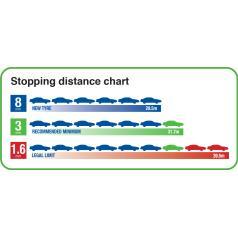 It is not only unsafe to ignore the minimum tyre tread depth, it's against the law. For each illegal tyre you face a fine of up to £2,500 and the chance of three penalty points on your driving license. Even if you never use your spare it is still vital that you check that it is in good condition. Check the pressure and the tyre tread periodically.It is better to discover any problems in a safe and comfortable environment, i.e. at home, rather than by the roadside.